Many scholars believe that teaching and learning has not improved nationally because teachers as a group have not learned how to use data effectively to improve student learning. This is chiefly a leadership problem, because many school principals lack the necessary skills to make decisions-based on data. Additional research has revealed that teachers also lack the clarity and tools to understand how their students, schools, districts and states are performing. Thus, it is clear that extensive training needs to take place so that educators and educational leaders can develop the skills to work with data and grow comfortable using data tools that increase student achievement. Educational leaders need to make data more accessible and comprehensible for a workforce that has most likely avoided challenging coursework in statistics and mathematics. Getting these educators to embrace data-driven strategies may be a formidable challenge. For decades, businesses and government agencies have used cultural simulations to prepare executives for foreign travel, implement diversity programs, and ensure diplomacy at home and abroad. Few educational leaders have used these cultural simulations. Most will be surprised by the visceral epiphany they deliver. If similar simulations can be developed to ensure that all teachers become data-driven educational leaders, the U.S. education system could be poised to make a great leap forward. Gary Shirts, creator of the culture shock simulation BaFa’ BaFa’, outlines ten steps to successful simulations: 1) don’t confuse replication with simulation; 2) choose the right subject to simulate; 3) develop a design plan; 4) design the simulation, so trainees take responsibility for their actions; 5) use symbols to deal with emotionally charged ideas; 6) don’t play games with trainees; 7) use non-trainees to add realism; 8) develop an appropriate performance assessment model; 9) alpha test your simulation in low-risk circumstances; and 10) set your own standards for success. Most teachers are not trained as quantitative statisticians and requiring them to work within the realm of data is analogous to requiring them to learn a foreign language. Simulations can ease the anxiety of this process by providing safe places for teachers to increase their understanding of student achievement data and how to systemically collect and analyze that data for continuous instructional improvement. When teachers gain data literacy skills and improve their understanding, the data analysis tasks can become more sophisticated. Solving a problem for someone else is often less worrisome than bringing up your own problem areas and having others comment on them. As teachers become more confident about their analysis and use of data, educational leaders will see teachers displaying class achievement data and clearly showing students where they have improved. Spotlight Education provides a promising software service that simplifies educational data. Instead of extensive lists of statistics with difficult-to-read tables and charts, their service creates easy-to-read, narratives in either written or video form. 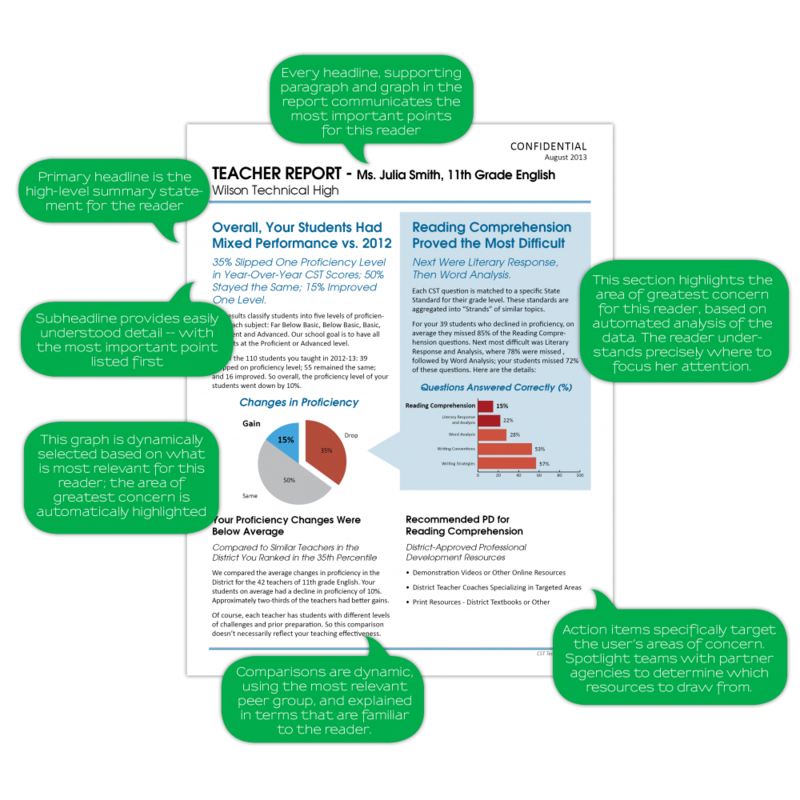 These reports offer insightful analyses of education data. They customize the reports for each stakeholder: teachers, students, parents, principals, or superintendents. Boudett, K., & Steele, J. (2007). Data wise in action: Stories of schools using data to improve teaching and learning. Cambridge, MA: Harvard Education Press. Boudett, K., City, A., & Murnane, R. (2005). Data wise: A step-by-step guide to using assessment results to improve teaching and learning. Cambridge, MA: Harvard Education Press. Corrigan, M., Grove, D., & Vincent, P. (2011). Multi-dimensional education: A common sense approach to data-driven thinking. Thousand Oaks, Calif.: Corwin Press. Mandinach, E., & Jackson, S. (2012). Transforming teaching and learning through data-driven decision making. Thousand Oaks: Corwin Press. Mandinach, E., & Honey, M. (2008). Data-driven school improvement: Linking data and learning. New York: Teachers College Press. Shirts, G. R. (1992). Ten secrets of successful simulations. Training, 29(10), 79-83. There are substantial differences in MOOCs and in online courses taken for credit from California Community Colleges (CACCs). MOOCs are most often free and seldom for credit. Whereas, CACC online courses charge a fee and can be used for credit toward a certificate or Associate’s Degree, and/or be transferred to four-year universities. Despite these differences, it is reasonable to infer that CACC results from for credit online classes could set a benchmark for MOOCs to achieve, if they are to realize their promise in expanding free online education. The Public Policy Institute of California published Online Learning and Student Outcomes in California’s Community Colleges. 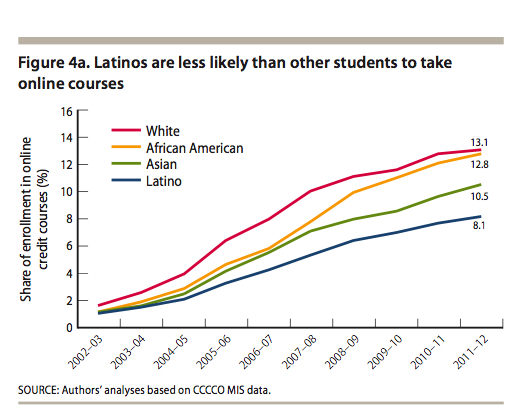 Johnson & Mejia (2014) examined longitudinal data from 750,000 enrollments from all 112 CACCs and found that online course success rates are lower than traditional courses. Further online learning increased racial achievement gaps. In 2011–12, 79.4 percent of enrolled students completed online courses, compared to 85.9 percent of those enrolled in traditional courses. While 70.6 percent of traditional students passed their courses, only 60.4 percent of online students passed. This 10-point gap has remained unchanged over the past ten years. In every college and in every subject area, students are less likely to succeed in online courses than in traditional courses. Despite these negative short-term findings, the authors point out a positive long-term trend that bolsters hope for the expansion and viability of the online learning model. About 38 percent of community college students in the sample completed at least 60 units. 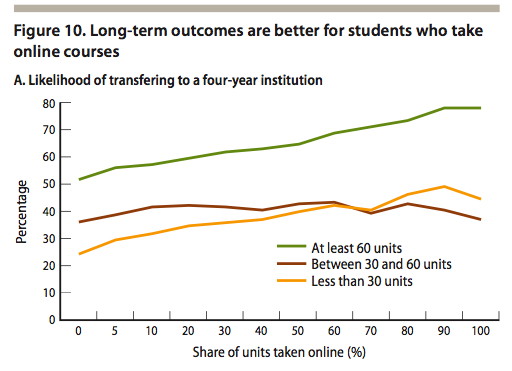 For these students, taking online courses was strongly associated with improved long-term success rates. This was not true for students who completed between 30 and 60 units, approximately 22 percent of the sample. In this group, those who took some units online had only slightly higher completion rates than those who took no online courses. Thus, Johnson & Mejia found that students who have taken an online course were more likely than those who have not to earn an associate’s degree or to transfer to a four-year university. With approximately one million students, online enrollment represents nearly 11 percent of all community college course enrollments. Educators and policymakers are optimistic about online learning’s potential to either reduce costs, or offer greater access. Johnson & Mejia optimistically conclude that online performance gaps can be minimized with strategic planning, improved technology, and increased funding. These results from a large sample of online learners should inspire MOOC providers and online learning enthusiasts, for they offer important data points to consider when comparing success rates between MOOCs and formal online education programs. What are the factors that enable fee-based community college online courses to have 60 percent course passage rates, while MOOCs, which are free and offer no credit, struggle to get 5 percent of their enrollments to complete the class? What would the course passage rate be if MOOCs were introduced in the K12 education market where compulsory attendance requires students to remain enrolled until they are 18 years old? Online learning has the potential to increase access to higher education and to improve student achievement. CACCs could receive $56.9 million over the next 4-5 years from Governor Brown’s Online Education Initiative (OEI). What educational outcomes should we expect for that level of investment? For online courses to disrupt the status quo in public education they need to be less expensive than traditional, face-to-face courses and they need to yield comparable, if not superior, student outcomes.